he 3 Day Gold Pass gives you the best seats at the Airshow in a grandstand situated directly in front of the runway. All seats are elevated for unobstructed viewing of the entire show. You will have exclusive access into the marquee where closed circuit TV will be available. Celebrity pilots will also be mingling and you will have the opportunity to walk down the aircraft flight line. Also included is a souvenir pack containing a Gold Cap & Badge; collectorâ&#x20AC;&#x2122;s Airshow programme; voucher for entry to the Warbirds & Wheels Museum and a complimentary drink voucher. ollowing the success of previous Warbirds Over Wanaka Tours, in 2020 Grand Pacific Tours is once again pleased to offer you the opportunity to experience all the excitement and entertainment of the internationally renowned Airshow combined with the scenic beauty of New Zealand. Wanaka is the most spectacular venue in the world to host New Zealand’s biggest aviation event. Nestled on the shores of an azure blue lake amongst the mighty peaks of the Southern Alps, the natural amphitheatre created by these mountains provides a backdrop of stunning scenery. For 3 days over Easter, Lake Wanaka will become centre stage for an extravaganza of high-octane aviation excitement never seen before in New Zealand. For over 30 years, the Warbirds Over Wanaka International Airshow has been firmly established as one of the world’s ‘must do’ Warbirds airshows. 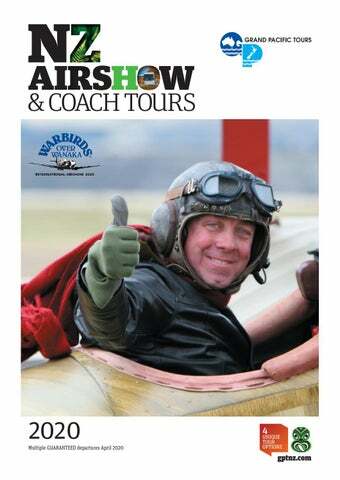 Experience the romance of aviation from the early 1900’s come to life by famous Warbirds joining forces with the classic aircraft of yesteryear and the modern jets of today to present a feast of aviation action. The tastes and flavours of Central Otago are also on show with a range of gourmet options featuring the best of the local produce. The special sunlight and cooler nights produce great pinot noirs which are now internationally recognised and available for sampling. Stay a little longer City	Twin share	Single Christchurch	$125	$250 Extra night rates are per person and based on room only. Subject to availability. Prices are in Australian Dollars. **Prepaid taxes are subject to change. Exact amounts will be confirmed by your travel agent at time of booking. If you do not wish to >> attend the 3 Day Warbirds NOT Over Wanaka Airshow ATTENDING deduct $300 per person. AIRSHOW? Please advise at time of booking. There are a number of sightseeing options available in Queenstown (own expense). ITINERARY (B) Breakfast. (L) Lunch. (D) Dinner. and Warhorses (military vehicles), sport aircraft and aviation trade stands. Taste wine and food from Central Otago or use your voucher to visit the Warbirds and Wheels Museum, which showcases the story of Sir Tim Wallis, founder of the Warbirds Over Wanaka International Airshow. DAY 5: Warbirds Over Wanaka (B,D) Travel to Wanaka over the next two days where Wanaka Airport will become your home as you are entertained by the world’s best display pilots flying aircraft overhead. Your ticket will gain you access to the Gold Pass Enclosure. Enjoy the ultimate in Airshow luxury as you will be situated on the flight line with grandstand seating and a plush marquee where you can relax in comfort and watch the show from the best seats in the house. DAY 6: Warbirds Over Wanaka (B,D) On the final day, all eyes will be in the air as you watch some of the world’s most iconic Warbird aircraft plus modern military machines, aerobatics, sport aircraft and so much more. The aerial action is backed by world-class pyrotechnics when the Airfield is defended by the fighters from an attack by enemy aircraft. The show culminates in a massed Fighter flypast, a sight not to be missed! DAY 7: Queenstown - Christchurch (B,D) Depart Queenstown & travel north through the dramatic Lindis Pass where the landscape is dominated by tussock grassland and snow capped mountains. Continue through the Mackenzie country into Christchurch. This evening enjoy dinner with new friends. Hotel Sudima Christchurch Airport Hotel DAY 8: Depart Christchurch (B) Your tour concludes this morning. You will be transferred to the airport for your flight home. OPTIONZ MOUNTAIN SCENIC SPECTACULAR On a 40 minute helicopter flight you will view the incredible natural phenomenon of the towering ice formations and vast size of the Franz Josef and Fox Glaciers. HAAST RIVER SAFARI Enjoy the opportunity to experience the untouched natural beauty of the South West World Heritage Area of New Zealand while travelling in a unique custom designed, fully enclosed Jet boat. SKYLINE QUEENSTOWN Take in the stunning views as you ride the Skyline Queenstown Gondola, the steepest cable car lift in the Southern Hemisphere and one of the must-do activities in Queenstown! CLOCKWISE FROM TOP LEFT: Experience the ultimate in Airshow luxury from the best seats in the house; enjoy panoramic views from the comfort of your coach; meet like-minded travellers; travel on the world-renowned TranzAlpine rail journey. If you do not wish to attend the 3 Day Warbirds Over Wanaka Airshow deduct $300 per person. Please advise at time of booking. There are a number of sightseeing options available in Queenstown (own expense). >> NOT ATTENDING AIRSHOW? ITINERARY (B) Breakfast. (L) Lunch. (D) Dinner. (SD) Specialty Dinner. DAY 1: Arrive Christchurch (D) On arrival into Christchurch you will be met by a Grand Pacific Tours representative and transferred to your hotel. Tonight enjoy dinner at the hotel and meet your fellow travellers. Hotel Distinction Christchurch DAY 2: Christchurch - Dunedin (B,D) Depart Christchurch and travel to the Air Force Museum of New Zealand for a ‘behind the scenes’ tour which showcases the restoration projects in action and provides a rare opportunity to climb inside a Bristol Freighter aircraft. Travel south to Oamaru, famous for its Limestone before arriving into Dunedin for an informative city tour. Hotel Scenic Hotel Southern Cross or similar (2 nights) DAY 3: Dunedin Sightseeing (B,SD) This morning travel along the beautiful Otago Harbour viewing many scenic highlights. At Larnach Castle enjoy a guided tour and hear the tragic and scandalous history. Enjoy time to wander around this Garden of International Significance followed by a delicious Devonshire Tea. Return to the city for time at leisure. Later, visit Speight’s Brewery, a Dunedin icon, for an informative and interactive tour through this working brewery. The tasting session will be followed by a delicious dinner at the Ale House restaurant. CLOCKWISE FROM TOP LEFT: Enjoy a tour of the amazing collection at the Bill Richardson Transport World; witness extraordinary flying acts at the Airshow; Nugget Point takes is name from the wave-eroded rocks that are likened to gold nuggets; enjoy a guided tour and Devonshire Tea at Larnach Castle. Airshow luxury as you will be situated on the flight line with grandstand seating and a plush marquee where you can relax in comfort and watch the show from the best seats in the house. DAY 10: Warbirds Over Wanaka (B,D) On the final day, all eyes will be in the air as you watch some of the world’s most iconic Warbird aircraft plus modern military machines, aerobatics, sport aircraft and so much more. The aerial action is backed by world-class pyrotechnics when the Airfield is defended by the fighters from an attack by enemy aircraft. The show culminates in a massed Fighter flypast, a sight not to be missed! DAY 13: Depart Christchurch (B) Time to say goodbye. You’ll be transferred to the airport for your flight home after a memorable New Zealand holiday. TE ANAU GLOWWORM CAVES Venture into the underground caves for a tour of the mysterious world of waterfalls and incredible rock formations before drifting into silent darkness beneath glittering glowworms. SHOTOVER JET Enjoy a jet boat ride in the spectacular Shotover River Canyons, carved out over the ages by a vast volume of fast flowing water. Hold on tight and take a spin in the iconic Big Red for wall to wall action from start to finish. Stay a little longer City	Twin share	Single Wellington	$135	$270 Christchurch	$125	$250 Extra night rates are per person and based on room only. Subject to availability. Prices are in Australian Dollars. **Prepaid taxes are subject to change. Exact amounts will be confirmed by your travel agent at time of booking. CLOCKWISE FROM TOP LEFT: The Milford Sound Cruise will be a highlight of your tour around the South Island; Arrowtown at its best in Autumn; Omaka Aviation Heritage Centre; watch some of the world’s top pilots perform aerobatics. OPTION TWIN GLACIER HELICOPTER FLIGHT Fly over both the Franz Josef and Fox Glaciers, and then following the ice flow high into the upper reaches. Land in the snow at the head of a glacier and survey the path that the glacier has carved below you. Stay a little longer City	Twin share	Single Christchurch^	$245	$490 Wellington	$155	$310 ^Extra night rates in Christchurch are per person and include full breakfast and other luxe benefits. Subject to availability. Extra night rates in Wellington are per person and based on room only. Subject to availability. Prices are in Australian Dollars. **Prepaid taxes are subject to change. Exact amounts will be confirmed by your travel agent at time of booking. DAY 4: Queenstown - Wanaka (B,D) Today you have the choice of either a free day in Queenstown or travelling to Wanaka for the opening day of the Warbirds Over Wanaka Airshow. No flying will occur today, however some practice will be happening overhead. On the ground check out the static displays which include classic cars and Warhorses (military vehicles), sport aircraft and aviation trade stands. Taste wine and food from Central Otago or use your voucher to visit the Warbirds and Wheels Museum, which showcases the story of Sir Tim Wallis, founder of the Warbirds Over Wanaka International Airshow. DAY 5: Warbirds Over Wanaka (B,D) Travel to Wanaka over the next two days where Wanaka Airport will become your home as you are entertained by the world’s best display pilots flying aircraft overhead. Your ticket will gain you access to the Gold Pass Enclosure. Enjoy the ultimate in Airshow luxury as you will be situated on the flight line with grandstand seating and a plush marquee where you can relax in comfort and watch the show from the best seats in the house. DAY 6: Warbirds Over Wanaka (B,D) On the final day, all eyes will be in the air as you watch some of the world’s most iconic Warbird aircraft plus modern military machines, aerobatics, sport aircraft and so much more. The aerial action is backed by world-class pyrotechnics when the Airfield is defended by the fighters from an attack by enemy aircraft. The show culminates in a massed Fighter flypast, a sight not to be missed! OPTIONZ ALPINE EXPLORER Fly by helicopter over the Ben Ohau Mountain Range and peaks of the Southern Alps that surround Aoraki / Mt Cook. Your pilot will manoeuver you to an alpine vantage point where it’s safe for a snow landing to take it all in. DART RIVER WILDERNESS JET Experience a spectacular journey into the heart of the Mt Aspiring National Park. Combine wilderness jet boating, a guided walk and backcountry tour by 4WD bus and take in the breathtaking scenery. WEST COAST WILDLIFE CENTRE FRANZ JOSEF The home of the official breeding programme of the world’s rarest kiwi called the Rowi. This attraction brings together nature, live kiwi and wildlife under one roof. DAY 11: Depart Wellington (B) Time to say goodbye. You will be transferred to the airport for your flight home after a memorable New Zealand holiday. CLOCKWISE FROM TOP LEFT: Enjoy business class on wheels as you travel onboard the Ultimate Coach; your Ultimate Coach Captain has been chosen for their professionalism and attention to detail; cross Cook Strait on the Interislander Ferry; you will see iconic aircraft at the Warbirds Over Wanaka International Airshow. ou’ll look the part when on tour with a BONUS GPT Tour Jacket, a great memento of your holiday for years to come. TOUR JACKET Unisex black waterproof shell jacket with embroidered logos, silver reflective piping, fleece lined collar, hood, inside mesh, adjustable Velcro cuff, double front and inside pockets, hidden draw cord and mobile phone pocket. Compact, lightweight, ideal for touring. Available in sizes XS to XXXL. Provide your size at time of booking. BOOKING TERMS & CONDITIONS Payment and completion of the GOOD TO GO Form to your Travel Agent acknowledges that you have read, understood and accepted these booking conditions. Grand Pacific Tours (GPT) is a 100% Australian owned company. 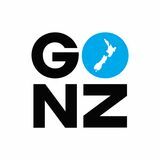 For a full list of booking terms and conditions, refer to gptnz.com Deposits & Payments At the time of booking a deposit of $200 per person is required for the 8 Day, 13 Day & 15 Day tours and $500 per person for the 11 Day Ultimate Tour. If the Tour Package includes flights, a further deposit to cover the airfare and taxes is also required at time of booking. The balance of payment, including any merchandise, is due 60 days prior to departure. Once the tour has been booked and confirmed cancellation fees will apply as per Terms and Conditions. Airfares The airlines require all Trans Tasman flight bookings to have the air ticket issued within five days of confirmation of the airline reservation. As GPT offer a fully inclusive package price, the dollar difference between ‘Land Only’ price and ‘Package Price’ does not represent the airfare deposit amount due. Enquire with your Travel Agent as to the exact amount of airfare deposit and taxes required at the time of booking. Surcharges may apply over peak travel times. Airline Indemnity Airlines carry no responsibility for any statement in this brochure relating to the ground content of the tours. These airlines act as air carriers only. GPT indemnifies the airlines against any claim, action, loss or damage that may arise. Minimum connecting times are as per IATA, airport and airline specifications. Flight sectors are booked as advised by the operating airline in accordance with their rules. Prices All holiday prices are based on schedules, fares and tariffs current at the time of printing. GPT reserves the right to vary the cost of tours if necessary, by reason of currency fluctuation, component cost increase or airfare cost. Tour costing will be guaranteed at the price prevailing at the date of final payment. The Australian pre paid taxes are subject to change. Exact amounts will be confirmed to your Travel Agent at time of booking. If you do not wish to attend the 3 Day Warbirds Over Wanaka Airshow please mention at time of booking and we will deduct $300 from your tour fare. The 3 Day Airshow cannot be purchased as individual days. Luggage Limits Each traveller is entitled to take one suitcase, the sum of its length, width & depth not to exceed 140cm. Weight limits apply to luggage due to Occupational Health and Safety regulations. The maximum allowed by most airlines and GPT is one piece up to 23kg. Luggage over this allowance will be charged by the airline at the applicable rate. If a traveller brings more than the allocated limit of luggage, any additional arrangements made to get their luggage to final destination will be at travellers own expense. Travellers on UItimate Small Group Tours are entitled to take 2 suitcases up to 23kg per piece, subject to airline limits. All luggage is entirely at the ‘owners risk’ whilst on tour and we strongly recommend that travel insurance be taken out by each traveller to cover accidental damage or loss. The GPT travel bag is designed to carry a maximum of 6kg. Due to limited space on board the coach, please ensure carry-on bags do not exceed this limit. Check with your Travel Agent for more details. Hotel Information GPT endeavours to utilise the most suitable hotels available in each location to ensure travellers enjoy a level of cleanliness, comfort & service. In more remote locations, hotel standards may not be as high due to limited choice. Should the hotels on tour change for any reason, we will endeavour to ensure that the alternative hotel is of an equivalent standard. Pre / Post Accommodation in New Zealand Hotel check in time is approx. 2pm and check out is approx. 10am. If early hotel check-in or late check-out is required due to flight schedules, additional accommodation will need to be purchased. The rates quoted in this brochure are only valid for one night, room only and subject to availability. Any additional meals will need to be ordered and purchased directly with the hotels, BB rates cannot be provided. Additional nights may be charged at the prevailing rate by the hotel. Dietary Requests GPT limit special dietary requests to Vegetarian, Gluten Free, Lactose Intolerant & Diabetic. These will be requested to the hotel but cannot be guaranteed. Religious dietary requests (ie. Hindu Vegetarian, Kosher, Halal) cannot be accommodated. Being a volume group tour operator contracting specific menus which range from Buffet to A-la-carte , the logistics of arranging meals meeting the correct criteria over an extended touring itinerary can be challenging and cannot be guaranteed to meet the expectations of the traveller. Any further intolerances needing to be managed are the responsibility of the traveller. Airlines have restricted dietary conditions which vary, ask at time of booking. Twin Share Travellers If you are travelling alone and do not wish to pay the single supplement, a twin share room will be provided with a person of the same gender. Smoking and special room requests are not permitted on this basis. It is your duty to disclose any medical or other conditions that may prevent you from being a suitable rooming partner and you must accept that compatibility with your rooming partner cannot be guaranteed. If at any time during the tour you consider your rooming partner unsuitable, we will endeavour to arrange single accommodation for you for the remainder of the tour, subject to availability and at your own cost. We accept no responsibility for the suitability of the allocated rooming partner. Room requests can be submitted and requested but not guaranteed. The option to twin share with another single traveller is not available on Ultimate Small Group Tours. Please enquire with your Travel Agent at time of booking. Single Travellers Paying the Single Supplement covers the sole use of a hotel room only, the coach is not single seating, you will be required to sit with a fellow traveller. Coach Seat Rotation For the enjoyment of all travellers GPT operates a daily seat rotation system which all travellers must participate in as a condition of booking. Travel Insurance Comprehensive Travel Insurance is not included but is strongly recommended for all travellers. It is the traveller’s responsibility to arrange their own travel insurance. Cancellations / Transfer of Booking In the event a traveller cancels off a tour the following fees apply prior to departure: - 60 days or more prior to departure, loss of deposit plus the cost of the airline ticket if issued. - Between 7 and 59 days prior to departure, 50% of the tour package price. - Less than 7 days prior to departure, 100% of the tour package price. If a traveller wishes to cancel their existing booking and transfer to a new departure date, the above cancellation fees still apply. Health and Fitness Payment of deposit by traveller(s) to GPT acts as a warranty that the traveller(s) is / are reasonably healthy and / or fit to participate in the tour and the traveller(s) indemnifies GPT from all actions, claims and demands arising out of any want of health and fitness. GPT reserves the right to remove a traveller from a tour if their health and / or fitness interferes with the tour or other traveller(s) tour experience in any way. Travelling with a collapsible wheelchair / mobility scooter is subject to availability at the time of booking as each tour only has the capacity to cater for one wheelchair / mobility scooter traveller. Accessible Rooms are subject to availability and not always allocated in the room type advertised. Responsibilities GPT advises that the service it provides is for the booking and packaging of goods and services provided by other operators such as cruise ships, hotels and transportation companies. Travellers are advised to familiarise themselves with the terms and conditions on which these services are supplied. Accordingly, GPT will not be responsible and will be excluded from liability for any loss, damage, omission or acts being negligent or otherwise, committed by the operators of airlines, cruise ships, coach companies, hotels or attractions used in connection with the tours. Optional Tours These tours are to be booked with your Crew whilst on tour. GPT does not operate these excursions. As such, no person employed or associated with GPT has any connection with the operators of these excursions. Accordingly, GPT cannot and do not take any responsibility for any injury, action, loss or damage of any type, arising in any manner from these excursions. Documentation GPT documentation including any merchandise will be forwarded to your Travel Agent two weeks prior to departure. PO Box address is not acceptable. Unfortunately we cannot accommodate early requests for documentation. Ticket wallet is one per person for Ultimate Small Group Tours and one per couple for all other tours. The traveller(s) is / are responsible for the acquisition of passports and appropriate visas, where necessary. We recommend that such documents, as required by governments, are finalised at least six weeks prior to the date of departure. Transfers Airport transfers in New Zealand are included. They will not be included if travellers have pre or post tour accommodation booked outside the Tour Hotels. Transfers provided surrounding pre and post tour dates must directly link to the tour and cannot be used on a broken stay. On arrival in New Zealand, the transfer vehicle will wait up to 1 hour after the flight lands. If your flight is delayed or changes please contact GPT. Should traveller’s flight departure details change, contact needs to be made to GPT or the transfer company to ensure new transfer arrangements can be confirmed. Any transfer expenses incurred as a result of flight changes NOT advised, will be at the traveller’s own expense. Validity Brochure valid for travel from April 2020. MERCHANDISE A complimentary jacket is included for all bookings on our Warbirds over Wanaka itineraries. Jacket sizes must be advised to your Travel Agent prior to final payment. Please refer to the website for delivery & jacket sizes. Exchanges can be made on unused merchandise, a $10 per delivery postage and handling fee will be charged. UNIQUE KIWI PRESENTATIONS Grand Pacific Tours along with local travel agents host informative travel talks onboard the incredible Kiwi ConnectioNZ coach. Visit NZcomestotown.com to see if an event is coming to a town near you. *Entries become property of Grand Pacific Tours and may be used in marketing.